Former Fiji Airways Fijian 7s playmaker Kitione Taliga helped the Tokatoka Westfield 7s side walloped Nawaka 22-7 in the Cup final of the Flemma Senibiau 7s tournament last Saturday. Speaking to SUNsports Olympian Taliga said it was team work that helped them win the $3000 top prize. “Though we had a short span of time to prepare for this tournament it was through proper coordination and working together which saw us victorious today,” he said. Westfield edged out Senibiau 12-10 in the first semifinal before Nawaka thrashed Army 26-0. Apart from Taliga, the Saunaka based-side had the services of Vilimoni Marawa, Sainivalati Ramuwai and Inia Rokomatu. Westfield manager Percy Nasau said despite the weather they were able to perform beyond expectation. “We had less time to prepare and we started training on Thursday,” Nasau said. 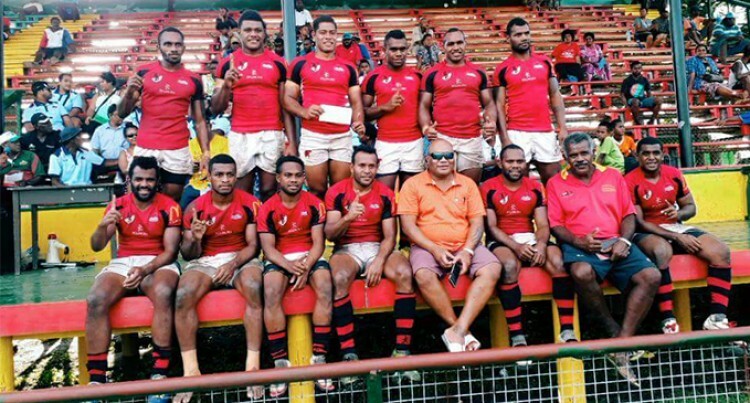 Nasau said they are now looking forward to play in the Fiji Bitter Nawaka 7s tournament. Tournament organiser Fiona Borisi said they did not expect so many teams to turn-up but was overwhelmed with the response. “It has been a successful tournament,” she said. Former Fiji Airways Fijian 7s prop Pio Tuwai has called on rugby fans to rally behind the work done by head coach Gareth Baber and the management team. Speaking to SUNsports last Saturday during the Senibiau 7s tournament at Garvey Park, Tavua, he pointed out that the team has been doing well. Tuwai played for Ba River and they failed to qualify from their pool. He also indicated that he is ready to don the national jumper if given another chance. Tuwai said he has learnt a lot from the tournament and is happy to be a role model to the younger players.